The following is a summary of our recent 2018 Market Outlook with Craig Johnson podcast, which can be accessed on our site here or on iTunes here. 2017 has been a terrific year for investors overall. For 2018, Piper's Craig Johnson expects the S&P 500 to run up to 3000 in the first part of the year before a pullback of 15-20% on problems in the debt market. He suspects we’ll see tax reform pushed through allowing for capital repatriation from money held abroad. There is $1.1 trillion in overseas investment accounts, he noted. If that money starts coming back into the US at lower tax rates, we’ll likely see a pick-up of share buybacks and special dividends, and an overall step-up in capex spending. That would likely push markets higher early next year and be an overall positive force for the economy. With futures markets calling for a rate hike in January, followed by another in March, we could see concerns develop over rapid rate increases. 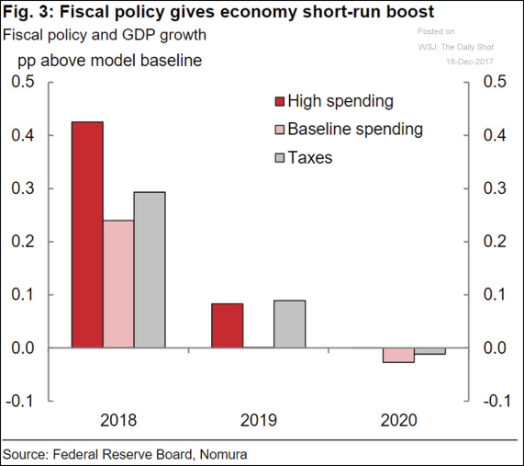 If we see tax reform and fiscal stimulus lead to a further pickup in the economy, and the Fed responds by raising rates while the long end of the curve doesn’t move, we may end up in a very awkward position for banks and institutions. The worrisome level to watch is a move above 2.60 to 2.70 on the 10-year, which would reverse a 30-year technical downtrend in rates, Johnson noted. If this move occurs, we will likely see a big sell-off in fixed income, which then would hit equities, triggering his drop scenario. 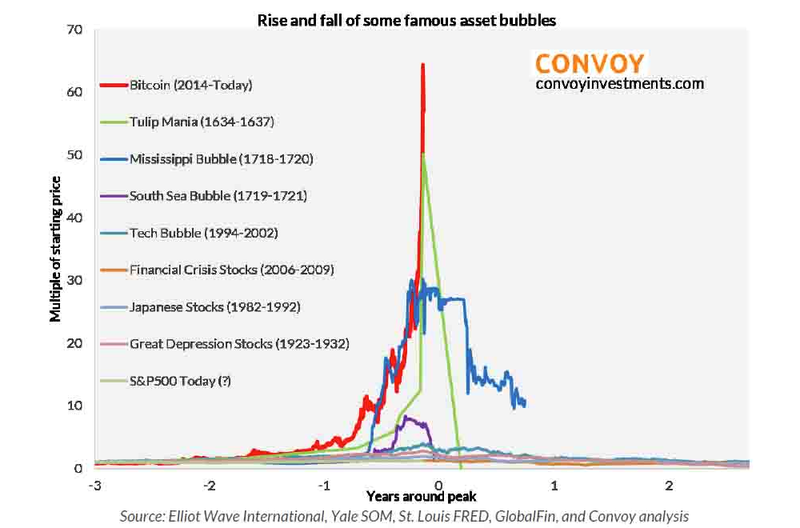 While Craig doesn’t see a mania in stocks, there are manias elsewhere with bitcoin now the biggest bubble in history, overtaking the tulip mania of the 1600s. Whether bitcoin will collapse, move sideways, or continue to head higher from current levels is purely a matter of speculation though, as we showed yesterday, bitcoin-tulip comparisons do have some merit. With a market cap of around $300 billion, bitcoin is now larger than Walmart, the largest company in the world by revenue. We should also consider bitcoin’s timeline in terms of a mania. Apple took 29 years to reach its current level from its IPO. Wells Fargo took 51 years to get to its current level. It’s taken bitcoin only 8 years to reach a market cap of $300 billion, Johnson noted. The only thing that’s been faster is Facebook, which since its IPO on May 18, 2012, has risen to its current market cap of $526 billion. Despite this, he isn’t ready to call a top and believes a maturation process will eventually unfold with cryptocurrencies as more internet users seek access to banking options worldwide. Johnson stated that Piper Jaffrey is overweight Tech, Energy, and Basic Materials, and is underweight Consumer Cyclicals, Staples, and Utilities. While he sees some sign of improvement in Consumer Cyclicals and Financials, there isn’t enough evidence to change direction yet. One interesting point is that, if we look at the relative outperformance we’ve seen in Industrials this year, it brings up the question of where are we in the overall business cycle. When Industrials have historically led, it’s traditionally indicted we’re in the middle portion of a traditional business cycle, Johnson noted.